Hanoi (VNA) – The Prime Minister has issued a decision on the compensation levels for damage from the environmental incident in the four central provinces caused by Hung Nghiep Formosa Ha Tinh Steel Company. 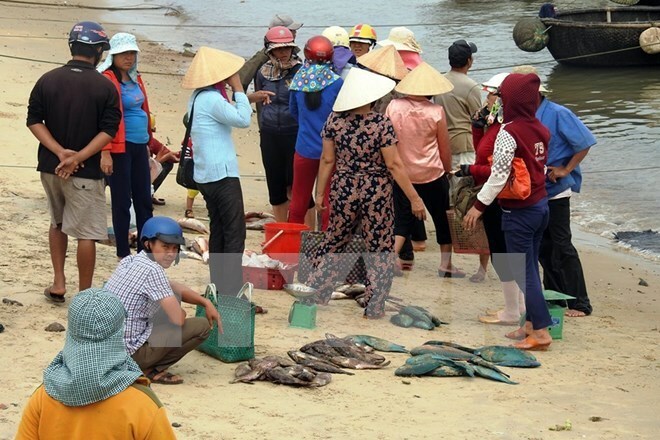 Under Decision 1880/QD-TTg promulgated on September 29, seven affected sectors in Ha Tinh, Quang Binh, Quang Tri, and Thua Thien – Hue will receive compensation, namely seafood harvesting, aquatic breeding, salt production, coastal seafood business activities, fishing logistics, coastal tourism services, and seafood stockpiling and purchasing. The compensation was based on the level of damage of the sectors. Owners and workers of non-powered vessels that are unable to go fishing offshore after the incident will get 5.83 million VND (262.35 USD) and 3.69 million VND (166.05 USD) respectively each, per month . Owners and workers of under-20 CV ships will receive 10.67 million VND (480.15 USD) and 5.96 million VND (268.2 USD) respectively. Compensation for owners and workers of vessels with engines from 20 CV to under 50 CV will be 15.2 million VND (684 USD) and 7.65 million VND (344.25 USD) respectively. Owners of vessels with engine capacity of above 800 CV will receive 37.48 million VND (1,686 USD) in compensation while employees of vessels with engines from 50 CV to under 90 CV will get 8.79 million VND (395.55 USD). Salt-making business will be compensated 39.7 million VND (1,786 USD) per hectare per month , while workers will get 2.91 million VND (130.95 USD) each. The decision also specified compensation for aquatic raising in salt and brackish water. Provincial People Committees will review compensation for the damaged sectors and report to the Ministry of Agriculture and Rural Development before October 5, 2016. The Ministry of Agriculture and Rural Development will verify the compensation in each locality to send to the Ministry of Finance to submit to the Prime Minister before October 10, 2016. The compensation time will be paid for six months from April to September 2016. The money will be sourced from compensation paid by the Hung Nghiep Formosa Ha Tinh Steel Company.